• The questions most asked by people unfamiliar with Hospitals & Institutions or as its known H&I are, “What is it and What does it do? “ Hopefully this flyer from JO will help all of us understand a little better. • If you would like to consider a rewarding service position within H&I, volunteers are constantly needed to visit those who can’t get to our meetings. This form will be necessary to visit the jails. Please download one by clicking here. Thank you. • New H&I speaker meetings will be held at the Sutter Hospital conference room in Lakeport from 7:00pm - 8:00pm on the second and the fourth Wednesday of every month. New support and volunteers are always welcome. • Plan for this one. Happening in May; The 46th Annual Hospital & Institution Conference “Free On The Inside” May 3rd, 4th and 5th at the Solano County fairgrounds in McCormack Hall. Check out the flyer for ALL the information. 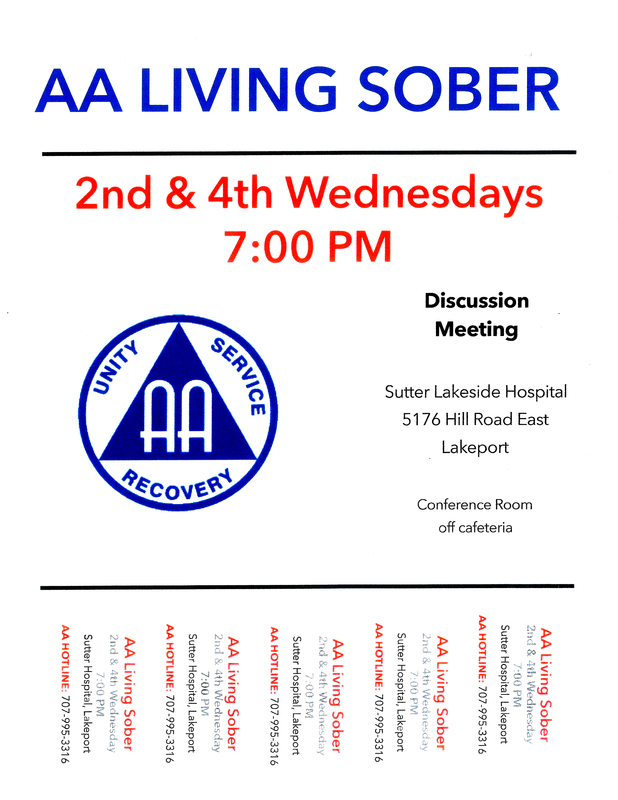 • A new Living Sober meeting flier is available for those who wish to post it at their meeting places. • The former DCMC for District 13, Mary Ellen has shared this handout from our Area on surplus cash held by H&I and how H&I will distribute a portion of it. It was requested that this flyer be added to the website so our fellowship is aware of this important information. Feel free to download or view it here.